This is the Final COAST Project Newsletter. After 5 years of Project implementation, the project comes to an end, with our 5th COAST Project Newsletter that highlights some key results in the subject of sustainable coastal tourism in Africa. The Newsletter shares exclusive news updates insights, and results on the implementation of the Environmental Management Systems (EMS) thematic area of the COAST Project through UNIDO’s Transfer of Environmentally Sound Technology (TEST) Methodology. 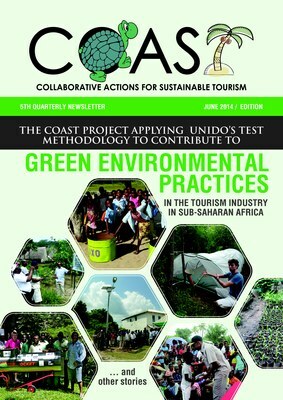 It is instrumental to note here that this is the first time the TEST Methodology is being applied to the tourism industry in Sub-Saharan Africa, and this Newsletter showcases some of the emerging results in its application in the demonstration sites in Watamu, Kenya; Inhambane, Mozambique; Saly, Senegal; and Bagamoyo, Tanzania. An Opinion Article by the Tanzania National Cleaner Production Center (CPCT) on their Experiences working in partnership to implement the UNIDO TEST Methodology tools to selected hotels in Bagamoyo, Tanzania. To read the stories in the attached download the English PDF Newsletter Edition here. This is a quarterly update on the COAST Project and its activities.